Major changes are taking place at the Courtenay and District Museum with the move of Canada Customs from the historic post office building. 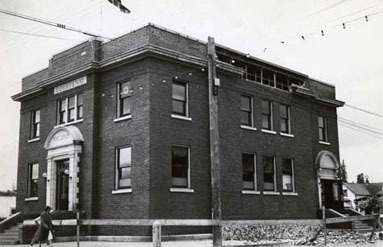 Canada Customs occupied the post office building since 1954. Time, technology and public needs precipitated the move. Although it was a poignant day when Canada Customs moved out, museum staff are now taking the opportunity to retrofit this beautiful, bright space for a new Katherine Capes Archives area and to renovate the old archival area to create a much needed programming and event space on the second floor for increased visitorship and revenues. To date, staff and volunteers have put over $7,000 of "in-kind" efforts into the project. Our appreciation is extended to Canada Customs who gave the museum over $3,000 of useful, period office furniture and fixtures which add even more to the atmosphere. One important component of this renovation for which we are seeking donation funds is roller shade blinds for the new archival area-- so please keep us in mind. The museum will have an opening for these two important renovations in the spring, so stay tuned for the date in upcoming newsletters. If you want to run a marathon, you don�t just show up at the starting line. You train, get advice from people who have done it before and put in lots of practise time. Successful authors do the same when they�re writing a book. 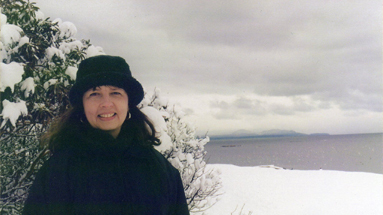 The Courtenay and District Museum is pleased to host award-winning author Paula Wild at Capes Escape vacation rental in July. This small group intensive writing retreat is guaranteed to flex, strengthen and tone your writing muscles. You'll meet a variety of published authors, get serious feedback on your writing and - just as important - have time to work on your manuscript. The theme for BC's Heritage Week (February 20-26) in 2012 is "Energy in BC, A Powerful Past, A Sustainable Future". 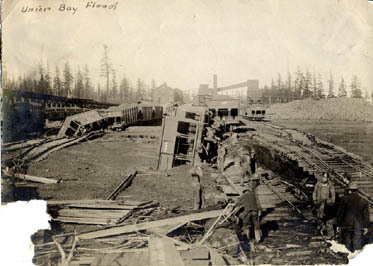 To commemorate the topic we include this photograph of the damage to Union Bay when the power dam (Washer Creek Dam) collapsed on Saturday, February 10, 1912. You can also read the original newspaper article from the February 17th edition of The Islander. A tip of the hat to downtown Courtenay business owner Jorden Marshall for incorporating heritage into his Hot Chocolates décor. Marshall commissioned artist Kelly Everall to paint a mural on the west wall to include the original "Fields" store sign that was exposed during the Scotia Bank renovation. "I asked Kelly to work the pattern and color of our upcoming packaging into the design. What Kelly came up with was the design which featured both our colors and pattern while holding onto the historic feel and nature of the color and the sign. The color was the biggest challenge as it is a milky old school color where our reds are very intense. Kelly chose the tones that marry the old with the new" says Marshall. Marshall's goals were to improve the public space while hinting at what's on the other side of the wall - and the striking mural does exactly that. The Courtenay Fields store opened at 368 5th Street in May of 1971. It was the 23rd Fields store in BC. Fields remained there until 1987-88. This horn spoon, donated from the Filberg Estate in 1976, illustrates a fine level of craftsmanship. The carvings on the handle represent a bird, bear and frog. 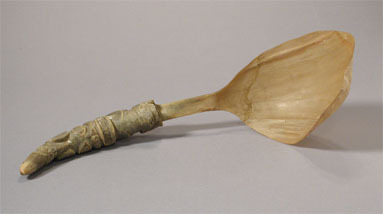 The UBC Museum of Anthropology website tells us that: "Along the Northwest Coast, in general, undecorated spoons of wood and horn were used in everyday life, while more elaborately carved versions were used on special occasions. Horn spoons were often passed down in families as heirlooms, such spoons are generally darker in colour than those of recent manufacture. The bowls of these spoons are too large to place in the mouth, so food is sipped from the sides or the end." As the Capes bookings come in, anticipation regarding its potential grows.� Amid the sounds of dinosaur cries and squeaking floorboards, museum staff will often be heard discussing ways to increase awareness of Capes Escape, both to the local and broader communities. The house itself offers comfort and warmth for a family holiday while its atmospheric charm is perfect as an artist�s retreat.� The writing desk at the living room window is inspirational.� Outside the pane glass the naturally beautiful grounds, bordered by trees, provide an open area suitable for many different types of occasions.� In honour of the Valentine month of February, it should be noted that two recent reservations are for wedding parties. Capes Escape is an important part of the lively, culturally rich Comox Valley.� We look forward to another year of welcoming our guests as well as your thoughts and ideas. Have you been feeling the chill this winter? Perhaps you'll enjoy the following unsigned piece that appeared in the February 1949 edition of the Courtenay High School publication "Shreds & Patches". Lots! News on lectures and events, fifteen percent discounts in the gift shop on non-consignment items, discounts on lectures and a chance to be involved with one of the most active regional museums in B.C. Buying a membership supports heritage, education and activities. If you're not a member already, please join us today! Please consider supporting the Courtenay and District Museum through a charitable donation. Your donation helps support programming, museum activities and long term operating of the Courtenay and District Museum. This is a great time of year to donate and receive a tax receipt. You can donate online or by mail, details for both are available through the link below. Either way, we'll send acknowledgment and a receipt as soon as your donation is received. Daryl and Evelyn Wright-Francis Jeweller's Ltd.
You can view more photos like this on our website. Click here to visit our holdings. The Courtenay and District Historical Society was registered as a nonprofit society in 1961 to preserve and interpret cultural and natural heritage of the Comox Valley. It has functioned as an independent society since that time. Funds are derived from the generous support of the City of Courtenay, British Columbia Arts Council, Comox Valley Regional District, British Columbia Gaming Branch, and from museum generated revenues and donations.